The Chinese stock market is in the doldrums. Having tumbled 56 percent in 9 months since October, it's fast losing its primary function as a source of funds to finance the growth of the corporate sector. At a time of credit tightening to combat inflation, this impotence of the stock market has become all the more unpalatable. A combination of factors, both domestic and foreign, have depressed share prices and the daily average turnover in the stock market. The benchmark Shanghai Composite Index had recently sunk to the 2,600 level, down from the peak of 6,214 last October. The average daily turnover on the Shanghai Stock Exchange in May retreated to 98.6 billion yuan ($14.44 billion) from 212.5 billion yuan in May 2007. Such is the condition of the market that any mention of a new share issue by listed companies to raise additional capital is not only jeered by investors but, more seriously, causes sharp plunges in the index. Several major companies including Ping An of China have hastily withdrawn their plans to raise money when investors voted against such moves with a deluge of sell orders. The problem has not escaped the government. Shang Fulin, chairman of market watchdog China Securities Regulatory Commission, has reportedly said "total efforts" must be made to preserve the stability of the capital market. 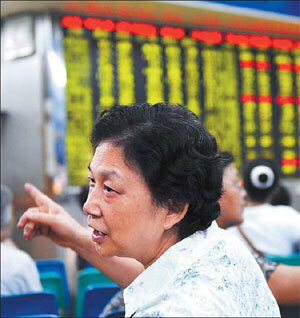 The People's Daily recently published an article recommending 10 government measures to revive the stock market. This included exercising stricter standards to regulate non-tradable share conversions, exerting further controls on large-scale new share issues, establish a timetable for the launch of index futures to stabilize prices, encourage stock repurchase by listed companies, especially by large State-owned enterprises, and setting up a special government fund to help shore up share prices. The publication of this commentary in the official paper has been widely seen as an indication that the authorities are gearing up for direct intervention to stabilize the stock market. Economists and stock analysts say there are numerous fiscal, monetary and administrative tools available to the government to revive market confidence. "The securities regulator should make it a priority to revive the market's basic function as a source of finance for companies," says Zhang Xiaojun, an analyst at CITIC China Securities. "The government has demonstrated in the past that it has the will to intervene when needed." On April 20, the government announced stricter restrictions over the conversion of non-tradable shares to tradable ones to ease investor concerns about a possible influx of new scripts dragging down share prices. Three days later, the stamp duty for stock trading was cut to 0.1 percent from 0.3 percent. The government also asked some fund management companies to cooperate by refraining from dumping their holdings. These moves had sharp but short-lived impacts on the market as investors continued to be troubled by escalating oil prices, a depreciating US dollar and the specter of a global economic slump. Investor confidence has also been low as a result of the government's credit tightening policy to fight inflation. The sluggish stock market plus the continuous credit tightening have forced companies to search for new ways, such as issuing corporate bonds, to find funds to fuel growth. However, bond trading with inadequate liquidity as well as the insufficient development of the rating system has impeded companies funding from this market. With a number of big-caps dropping below their IPO (initial public offering) prices, many companies are concerned about the waning function of the capital market as a source of funding. Starting from China Pacific Insurance Co in late March, several big-caps including PetroChina, China Coal Energy, China Shipping Container Lines Co, China Railway Construction Co, China Construction Bank and other blue chips plunged below their IPO prices in the first six months of 2008. What's more, share prices of some listed companies have fallen from 30 to as much as 200 percent shortly after making new issues. Latest figures show there are 114 companies whose current share prices have dropped below the issue price of their new shares. "Sharp price drops always followed new share issues, which has almost become the rule over the past year," says Mao Nan, an analyst at Orient Securities in Shanghai.